Tracking doesn’t always mean secret cameras. We are tracked via machine algorithms examining our data footprints– and we freely offer data each time we go online. In class Tuesday we are going to be watching the 2017 TED talk “We’re building a dystopia just to make people click on ads” by Zeynep Tufekci. This will start at 5:00 pm ET (check for local time). We will be pausing at key points so our students can respond or ask questions via Twitter. Please include the #netnarr hashtag and if it is a question for the presenter, also include @zeynep in your tweet. You can stay on track with our timing and discussion by following tweets by @netnarr — we will provide the timestamp of each segment of our discussion. Zeynep’s work explores the interactions between technology and society. She started her career as a programmer, and switched to social science after getting interested in social impacts of technology. Zeynep, who grew up in Istanbul, Turkey, and came to the United States for graduate school, is now an associate professor at the University of North Carolina and a contributing opinion writer at the New York Times. She’s currently also a faculty associate at the Harvard Berkman Klein Center for Internet and Society. Watch the talk on the TED site using the transcript view; this lets you jump to exact portions in her talk. 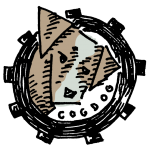 Thanks to our open participant @dogtrax! Use this tool to do to video what we are doing with hypothes.is to web text. You can see a listing of all Kean University #netnarr alchemists as well as a different list for our open participants. A way to view all Kean University student posts or just see one at random— a way to find a post to read and comment on. A way to view all Open participant posts or just see one at random— again a way to find a post to read and comment on. Commenting is very good alchemy! And also, as many are doing already, please tweet out your blog posts too, if you would like some feedback (or just to become famous ;). Last week we had you look at some of the “absurd/invasive technologies” gathered by Chris (@hypervisible) on Twitter. He’s agreed to visit class this week to share his perspective on the darkness of the internet, how he deals with it, manages his information flow, and whatever else you might want to ask him. Kean students will watch in class, but if anyone wants to join the hangout from where you are, please sign up for a seat. We have tasks for you to do outside of class. They should be… illuminating? Do you feel like your digital self is slipping out of control? Have you let yourself install too many apps, clicked “I agree” a few too many times, lost track of how many accounts you’ve created? Perhaps you’re not as in-control of your digital life as you’d like to be. Don’t despair; this data detox is for you. By the end of the next 8 days, you’ll be well on your way to a healthier and more in-control digital self! **This week complete Day 1 and Day 2 activities of the Data Detox. One of the ways this is an interactive documentary is that on visiting the site, you can login and give access to your social media accounts– ironically letting the documentary track you. This will mean the content will actually be tailored to what it learns about you (don’t be creeped out! it enhances the experience). **Watch Episode 1 of Do Not Track this week (episodes are only 10-12 minutes). As a bonus, last year we hosted a Studio Visit with Documentary creator Brett Gaylor offering a chance to learn more about how and why it was made. Who are we in the twitter network? To explore your building network (over the time of this course), we ask you to take a snapshot of your own Twitter presence. Some of you will have extensive tracks already, while a few have their first footprints in the digital sand. We are doing this snapshot now to create the basis for a comparison with a snapshot you will take at the end of the course. We are planning a “before” and “after” lens into your networked learning activity in #netnarr. 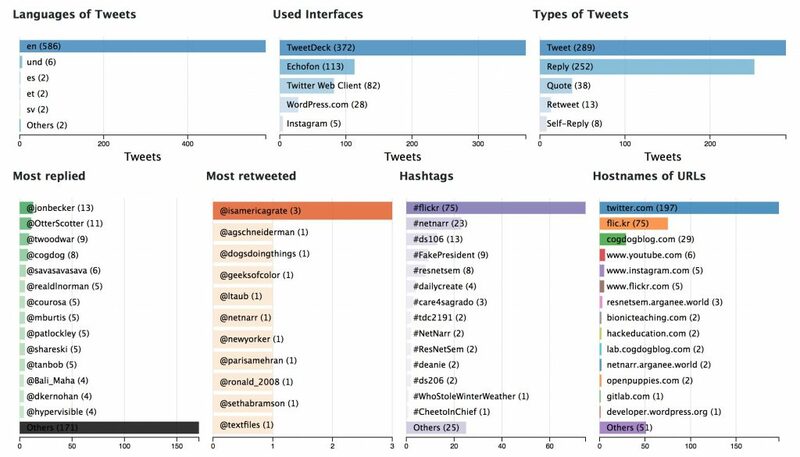 We will use the Twitter Account Analysis tool created by Luca Hammer. When you go to the site, click the Sign in With Twitter button. Once you have given permission to this site, you can see a summary of your own twitter activity. 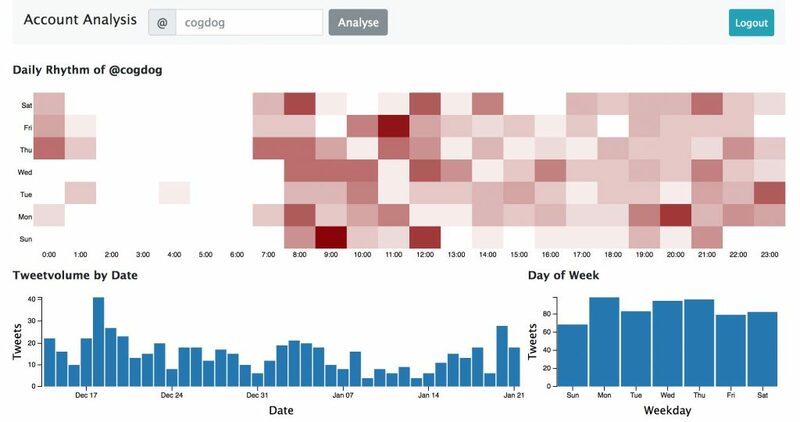 On the first screen, you can see data on your activity – when and how much you tweet. I tweet more in the mornings and more on weekdays. What does your activity indicate? Make a screenshot of your own activity like I did above (if you need help saving a screenshot as an image file on your device, refer to take-a-screenshot.org). Save this file and use it in your blog post. You can see I tweet most from Tweetdeck but a fair bit using Echofon (mobile app). My activity is almost equal tweets and replies, and you can see whom I interact with and the hashtags I use. As an individual, this is rather useful as an insight into my own activity. You may notice you can look at the activities of any other twitter user. And you may wonder about what all this data means in aggregate. Panoptoclick https://panopticlick.eff.org/ tests your browser for how much tracking it allows. Am I Unique? https://amiunique.org/ lets you see the subtle ways your computer can be tracked from patterns in your browser set up or computer. Disconnect https://disconnect.me/disconnect lets you see invisible sites that track you and offers ways to block them. Take action! Lightbeam https://addons.mozilla.org/en-GB/firefox/addon/lightbeam/ This is a Firefox browser add on that also illustrates the way you are tracked on visiting ordinary web pages. Trackography https://trackography.org/ gives you a map based way to see how.where your data tracking moves around the world. Travel with your data? Examine what Facebook algorithms predict about you with the Data Selfie tool or explore how much you are worth to Facebook with the Facebook Data Valuation tool. Install the Ghostery extension to see what kind of data is sent in your everyday web visiting. Complete at least two Digital Daily Alchemy activities this week. Make sure you are including both the @netnarr account and the daily specific tag #dda*** in your responses on twitter. And as you participate in the DDAs, note that we “track” you on the leaderboard. If you click your twitter name, you have your very own personal archive of DDA responses. Summarize all of your activity, thoughts, fears, reflections into a weekly summary post on your blog (be sure to tag/categorize/label these posts as weeklies. Why? We can see them all here http://netnarr.arganee.world/tag/weeklies/. In addition, we now start a weekly task to write two shorter blog posts (which are separate and different than your weekly reflection blog post. 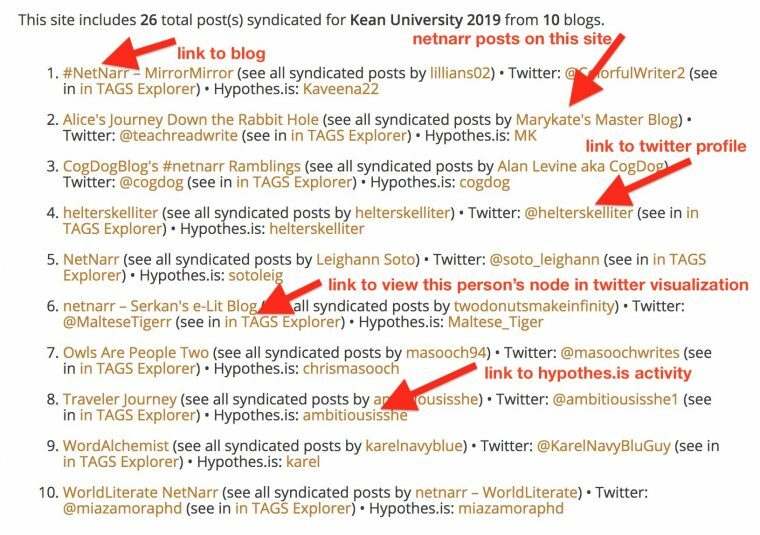 Your two short posts should each summarize some new reading, reference, article, or video you found this week (beyond the ones we share in the #Netnarr announcements). Your short blog posts should share something that you think might be useful as we work towards our goal of writing a collaborative Field Guide to Surviving the Internet Darkness. Include in your post the link to the item with a short summary, why it is relevant, and some kind of rating (0-10 where 0 is darkest and 10 is lightest) as to how optimistic it makes you feel. Tag each post fieldguide (one word). Why? This will make it easier again for you to find your own posts in your blog, and we can all collectively see what we do as a group of alchemists. 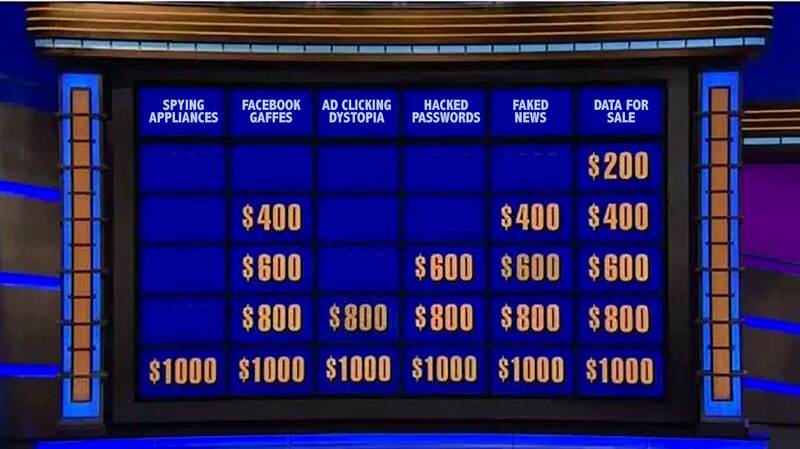 Featured Image: A category modified version of a Jeopardy screen found on the Jeopardy web site. Questionable on copyright, but consider it a bit of commentary and parody of public information. We love Jeopardy!